Amersoft was established in October in 1984. The company office was located in the Weilin+Göös printing house on Ahertajantie in the Tapiola neighborhood of Espoo. During its existence, Amersoft published IT-related literature, as well as computer programs and games. Gunnar Nyström acted as the President of company. He’d joined the Amersoft from his previous job as the Development Manager of Wulff Data. Nyström had been involved in the sale of IBM PCs, and after moving to Amersoft, he started searching for writers for PC-related literature. 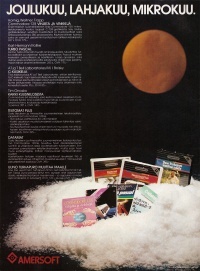 He posted a vacancy ad in, for example, PC-käyttäjä (PC-User) magazine in October 1984. Amersoft advertisement in the MikroBitti magazine in December 1986. Amersoft published dozens of books on programming, how to use software, and on other IT-related topics. Along with Commodore related literature, many guides were published for the users of MSX and IBM PCs. When it came to software, Amersoft’s publishing was mainly concentrated on Commodore computers. They found game makers through a competition put together by PCI-Data, as well as through code lists that were published in computer magazines, and through games that people sent to the company. Amersoft received lots of game makers’ own games after the Uuno game’s success. The company required changes to these games before they published them: the content needed to be changed to be more commercial, the name had to be changed, or the game had to be modified for another computer. Most of the games that Amersoft received were never published, but if they were lucky, the company would remember the programmer’s name for when they were planning their own production. Gunnar Nyström, President from 1984 to 1987. Risto Rautakorpi, Product Manager from 1985 to 1986. Jouko Riikonen, Software Consultant from January 1985 to April 1986 (the producer of Afrikan Tähti). Petteri Bergius, Software Supplier, 1985? Petter Kinnunen, Software Supplier, 1986? (the producer of Uuno Turhapuro muuttaa maalle). Amersoft discontinued its operations after a few years as they were financially unprofitable. Toptronics’ founder Petri Lehmuskoski wonders in Finnish Video Games: A History and Catalog whether the financial losses were due to piracy, as well as the lower quality of Amersoft’s games compared to foreign games, and Finland’s small market. Mehulinja, Herkkusuu, Myyräjahti 89 marks Sales remained low 1000–2000 marks The game maker didn’t get anything on top of the advance fee as the sales were so low. RahaRuhtinas - Sales remained low 1000–2000 marks The game maker didn’t get anything on top of the advance fee as the sales were so low. Delta 16 - 101 copies 3000 marks As per the contract, commission was 15% of each game sold on top of the advance fee. Afrikan Tähti - Sales remained low 10 000 marks As per the contract, the game makers were not eligible for a commission. The first game that Amersoft published was Mehulinja. Made by Simo Ojaniemi in January 1984 for VIC-20, Juice Belt had gotten the shared first place in Commodore’s importer’s programming competition. Soon after, Ojaniemi signed a contract with Amer’s subsidiary Weilin+Göös for three games. Juice Belt was translated into Finnish and newly established Amersoft published the game the same year. 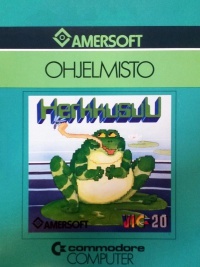 The other two games that Ojaniemi made for VIC-20 were Herkkusuu and Myyräjahti, which were published in 1984 on a single cassette. Ojaniemi signed a contract with Amersoft for a fourth game called Hirmuvalta and they gave him a portable Commodore SX-64 to develop the game for Commodore 64. Amersoft wanted to change the name and finally the adventure game was published in 1984 on a cassette and floppy disk and became known as RahaRuhtinas. Juha and Mika Salomäki’s Yleisurheilu game had shared the first place in the Commodore competition with Juice Belt at the beginning on 1984. Amersoft published the game at the end of that year first on a cassette for VIC-20 and later on a cassette and floppy disk for Commodore 64. Front cover of 10... Knock out! 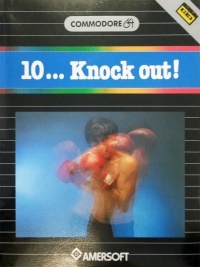 Juha Granberg’s and Janne Julkunen’s boxing game 10... Knock out! was published on a cassette and floppy disk for the Commodore 64 in 1985. That same year saw also Pekka Pesonen’s Commodore 64 game Halleyn komeetta’s publishing on a cassette and floppy disk, as well as Crash 16 and Delta 16, which were created for the Commodore 16 by Jyri Lehtonen. Risto Lankinen’s Tsapp! and Tsapp! 16 games were published in 1985. Lankinen had made a reversi-type board game for VIC-20 in 1982, which had been published in a British magazine. Amersoft’s employee Petteri Bergius found the code list from the British magazine and Amersoft signed a contract with Lankinen. He ported the game for Commodore 64 and Commodore 16 and made it look more commercial. The games were published on a cassette and floppy disk for the Commodore 64, and on a cassette for Commodore 16. Afrikan Tähti was created with Promal programming language that Amersoft gave to Otso Pakarinen and Jari Heikkinen. The original board game’s creator Kari Mannerla had given permission for the game to be made. Pakarinen was mainly responsible for the programming of the game. Jouko Riikonen worked as the game’s producer. The programming took about two months and the digital version of this famous board game was published for Commodore 64 at Christmas of 1985. Amersoft’s most famous game Uuno Turhapuro muuttaa maalle was published in 1986 for Commodore 64. The original programmer was meant to be Otso Pakarinen, but he was busy with other projects at the time. Petter Kinnunen who was working at Amersoft at the time contacted Pasi Hytönen towards the end of the summer of 1986. Hytönen had sent Amersoft a platform game called Little Knight Arthur, which wasn’t published but Hytönen ended up signing a contract for Uuno game with the company. They planned on the game taking two months to make. The musical score was created by Jori Olkkonen and the game was produced by Petter Kinnunen. There were 2000 copies of the game made, most of which were cassettes. The game sold 1,600 copies by Christmas. Hiring this summer assistant didn’t become profitable for the soft drink factory. The player manages the keyboard controller of the soft drink factory’s juice conveyor belt in Mehulinja. First you have to choose the speed for the conveyor belt, after which different colored bottles start appearing on the belt. They have to be filled with the right color drink. The player has to also close the barrier for the empty bottles and cork the filled bottled. The last step is to glue a label on the bottles. Different keys on the keyboard control the different colored juices, the barrier, corking, and label gluing process. Herkkusuu is about catching bugs with a frog’s tongue. The player gets a point for every bug caught, and the bugs get points for every time they sting the player. Whoever gets 30 points first wins the game. In Myyräjahti the player has to kill the voles that peek out of their burrows. The player has two minutes to kill as many as possible and each vole killed is worth one point. The voles appear randomly out of one of the eight burrows on the screen, and the player has to click on the hole early enough to kill the vole. Bombs also come out of the holes, and the player has to be careful to not click on them as the game is over if you do. In RahaRuhtinas the player is a tourist who ventures into maze-like Hirmuvalta and while exploring the country he meets the more or less weird inhabitants of this dictatorship. The goal is to earn as many points as possible and find the exit that’s located somewhere along the country’s border. One tour isn’t enough to see the whole country, but if you earn enough points you’re awarded another tourist tour. You earn points by depositing money on your bank account, by collecting cash and by accumulating other assets. In high jump, the 232 cm high bar can be easily jumped over (Commodore 64 version). In Yleisurheilu (Athletics) the players (up to four players at a time) compete against each other on track and field events. The VIC-20 version allows for up to six players. The athletics events included range from shot put, javelin, long jump and hammer to high jump. 10... Knock out! is a boxing game where you compete against famous boxers and in the end get to take on the ruling world champion. You win by knocking out the opponent or by winning enough points. You can knock the other boxer out by straight punches but these also deplete your energy. If you hit him with a hook you increase your energy. If neither of players knocks the other boxer out, the one with more points wins. The boxer is controlled with either the keyboard or a game controller. In Crash 16 the player transports backpacks to safety from water jugs. The hero Samuli has to avoid raining water jugs and make it to the right side of the screen where he gets a backpack. He now has to transport it safely to the left side of the screen where he earns 100 points and roof tiles for protection. He repeats the same maneuvers until you’ve lost all three lives. Robot ships have attacked Delta planet in Delta 16. The player has to hurry to save the planet’s helpless residents with the mother ship, which is located at the bottom of the screen. You can shoot aerial enemies one laser round at a time. The most dangerous enemy vessel is a fighter jet that bombs the player and the planet’s residents. It descents closer and closer to the planet with each bomb. The player earns points by destroying the enemy vessels and for every saved resident when the player dies. The mother ship is controlled with a keyboard or a game controller. UFO’s and meteors that hover in space threaten the player in Halleyn komeetta. At the beginning there is only one meteor, but as you advance through the game they increase by one at each level. They fall apart as you shoot them, and soon enough smaller pieces that are much harder to hit fill the screen. There are also UFO’s flying on the screen and when the level changes you might even encounter Halley’s comet. The player with black disks starts off strong. Tsapp! offers a reversi against the computer. As is with the board game, the players take turns in positioning the disks on the board, trying to take over the opponent’s disks. The one with more disks wins. In Afrikan Tähti the players are in the pursuit of finding the Star of Africa. The players move by throwing the dice and they turn the yellow circles that are along the way to find treasures. The one who finds the Star of Africa and transports it to safety wins the game. The digital version of this popular board game is loyal to the original version and the rules are the same. The map doesn’t fit onto the screen in its entirety, but scrolling around the different parts works seamlessly. You can play it as a single-player game against the computer, or with up to four players. Uuno Turhapuro muuttaa maalle is a skill game that scrolls sideways, where you have to go through three challenging levels and collect money to purchase a mansion. Based on a movie by the same name, the levels are recognizable from the film. The player has four lives that can be lost by hitting an obstacle or as you run out of energy. If you’ve collected enough money you can get placed on the high score list. The ultimate goal is to collect two million Finnish Marks and get to the end of the game where the prize is a picture of a mansion. Amersoft published Jyri Lehtonen’s Basic-kääntäjä (Basic compiler) in 1984. Published for Commodore 64 on a floppy disk, the program compiled the programs that use the most common BASIC commands into machine code. During the compiling process you could choose either Commodore 64 or VIC-20 as the target computer. A newer version of the program is also able to compile programs for Plus/4 and Commodore 16 computers. Basic-kääntäjä was sold for 325 Finnish Marks. 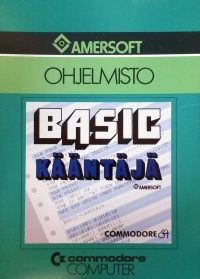 Opi ohjelmoimaan: Basic (Learn to code: Basic) was also published in 1984. It was a two-part program series for Basic-language’s self-study. The programs were published on a cassette and a floppy disk and they came with a manual. The translator for Sterling Swift’s original English-language How to Program in the Basic Language was Reijo Lundahl. The floppy disk version was sold for 295 Finnish Marks. Lasten opetuspelit 1 and 2 were published for the Commodore 64 as a cassette. Jorma Tarhio’s Sanatar program was advertised as easy to use and powerful word processing program. It was published for the Commodore 64 on a cassette and floppy disk in 1984 and the floppy disk version cost 395 Finnish Marks. 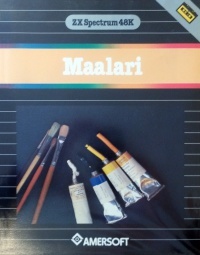 Arttu Soininen’s Maalari program was published for the ZX Spectrum in 1985 on a cassette, which came with a manual. The program let you draw pictures, save them on a cassette and use them later in home-made programs. Data Becker’s Textomat Plus word-processing program and Datamat database program was published in 1986 in Finnish. The programs were published for Commodore 128 computer and they cost 395 Finnish Marks. Datamat came with a 100-page manual. ↑ YTJ.fi, "Amer Sports Oyj". Retrieved 2016-04-25. ↑ Gunnar Nyström, LinkedIn profile. Retrieved 2016-04-22. ↑ PC-käyttäjät ry, "PC-käyttäjä 7/84". Retrieved 2016-04-25. ↑ 4.0 4.1 Juho Kuorikoski, Sinivalkoinen pelikirja, "Mies Uunon takana" (pages 15-16). Fobos 2014, ISBN 978-952-67937-1-9. ↑ Risto Rautakorpi, LinkedIn profile. Retrieved 2016-04-25. ↑ Jouko Riikonen, LinkedIn profile. Retrieved 2016-04-25. ↑ 7.0 7.1 Juho Kuorikoski, Sinivalkoinen pelikirja, "Tsapp! & Tsapp! 16" (page 22). Fobos 2014, ISBN 978-952-67937-1-9. ↑ Pelitutkimuksen vuosikirja 2009, "Pelinautintoja, ohjelmointiharrastusta ja liiketoimintaa" (page 28). Retrieved 2016-04-25. ↑ Juho Kuorikoski, Sinivalkoinen pelikirja, "Viihdettä rapakon takaa" (page 17). Fobos 2014, ISBN 978-952-67937-1-9. ↑ 10.0 10.1 10.2 MikroBitti, Amersoft's ad (October 3/84, page 24). ↑ 11.0 11.1 11.2 11.3 11.4 Manu Pärssinen & Markku Reunanen, V2.fi, "Näin käynnistyi Suomen peliteollisuus, Haastattelussa Simo Ojaniemi" (2015-08-19). Retrieved 2016-04-22. ↑ 12.0 12.1 Videogames.fi, "Delta 16". Retrieved 2016-04-23. ↑ Manu Pärssinen, V2.fi, "Näin syntyi Afrikan tähti kotitietokoneelle" (2014-09-17). Retrieved 2016-04-23. ↑ 14.0 14.1 14.2 MikroBitti, "Voiko pelintekemisellä elää Suomessa?" (1986). Archived from the original on 2014-09-09. Retrieved 2016-04-23. ↑ Videogames.fi, "Yleisurheilu". Retrieved 2016-04-23. ↑ Videogames.fi, "10... Knock Out". Retrieved 2016-04-27. ↑ Videogames.fi, "Halleyn komeetta". Retrieved 2016-04-23. ↑ Videogames.fi, "Crash 16". Retrieved 2016-04-23. ↑ Videogames.fi, "Tsapp! ", "Tsapp! 16". Retrieved 2016-04-23. ↑ Videogames.fi, "Afrikan Tähti". Retrieved 2016-04-23. ↑ Pasi Hytönen, MikroBitti (4/87), "Näin syntyi Uuno-peli" (pages 36-38). ↑ Pasi Hytönen, "Digikasarin kasvatti IV" (2016-01-14). Retrieved 2016-04-28. ↑ Manu Pärssinen, V2.fi, "Näin syntyi Uuno Turhapuro -peli, Haastattelussa pelin tuottaja" (2014-02-13). Retrieved 2016-04-23. ↑ NT Rautanen, "Suomen Commodore-arkisto: Basic-kääntäjä". Retrieved 2016-05-20. This page was last modified on 26 November 2016, at 11:37.